Everyone has heard many times over that Amazon paid zero Federal income taxes in 2018, but now that we’re one day past 2019 tax filing day, the middle class that’s being squeezed to the point of destruction will take little comfort in finding out about the other giants that are getting a free ride. 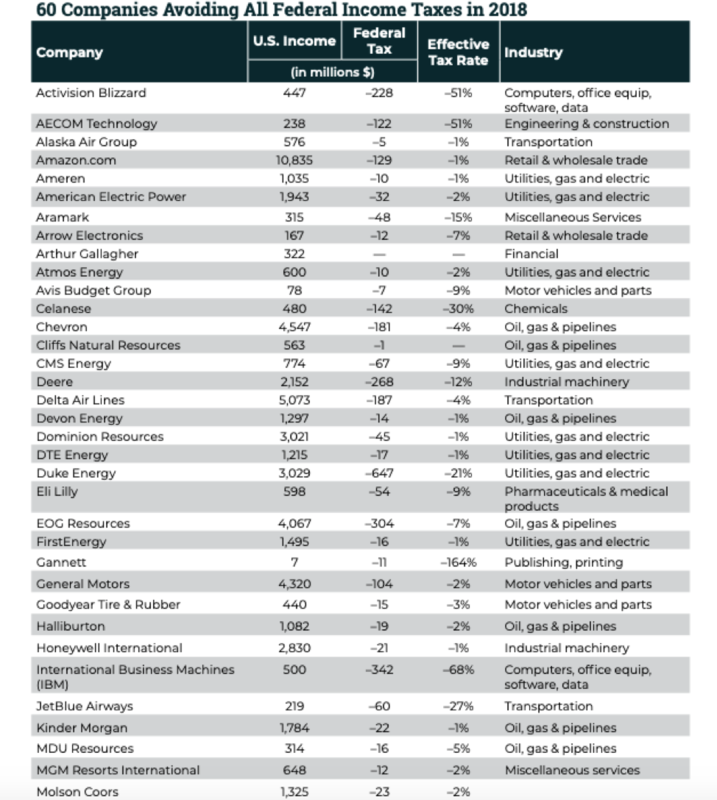 While we don’t yet have raw data on whether 2019 will shape up to be the same story as 2018, a newly released report from the Institute on Taxation and Economic Policy (ITEP) in Washington, D.C. details how 60 of the biggest companies in the country managed to pay zero. And that’s even with the significantly reduced 21-percent corporate tax rate that went into law in 2017. The report, entitled “Corporate Tax Avoidance Remains Rampant Under New Tax Law: 60 Profitable Fortune 500 Companies Avoided All Federal Income Taxes in 2018”, maintains that: “For decades, profitable Fortune 500 companies have manipulated the tax system to avoid paying even a dime in tax on billions of dollars in U.S. profits”. Overall, the report claims to have found that “60 of America’s biggest corporations zeroed out their federal income taxes on $79 billion in U.S. pretax income. Instead of paying $16.4 billion in taxes at the 21-percent statutory corporate tax rate, these companies enjoyed a net corporate tax rebate of $4.3 billion”. And on the Who’s Who of $0 corporate ‘taxpayers’, the report lists everyone from Gannett, IBM, Delta Airlines and Amazon to JetBlue Airways, Deere, Whirlpool, Activision Blizzard, Netflix, Molson Coors and General Motors--along with 49 others. Not only are they paying zero tax, but they’re reporting negative tax. According to the think tank, IBM earned $500 million in national income in 2018; yet received a federal income tax rebate of $342 million. Likewise, Amazon--a story that’s been circulating for many months already--had $11 billion in national income; yet still claimed a federal tax rebate of $129 million. Carrying the narrative further, ITEP noted that Netflix reported $856 million in national income and paid no federal income tax, while Molson Coors had $1.3 billion in national income and received a rebate of $22.9 million. Rounding out the story, GM reported a negative tax rate on $4.3 billion in income, according to the report. So how is this amazing feat of accounting achieved? According to ITEP, tax “avoidance” in this case is nothing illegal. The brilliant numbers are the result of legal loopholes ranging from accelerated depreciation and stock options to fossil fuels tax and alternative energy tax subsidies, as well as tax credits. But there’s also a does of ambiguity when it comes to what ITEP calls “vague financial disclosures”. Using examples, ITEP notes that Chevron’s annual report for 2018 “discloses that unspecified ‘tax credits’ reduced the company’s income taxes by $163 million”, while GM disclosed “$695 million of ‘general business credits and manufacturing incentives’”. SalesForce came in with $132 million in tax credits in 2018, while IBM listed “domestic incentives” that shaved some $110 million off their taxes. On the campaign trail in Minnesota Monday, Trump played up the tax reform, saying: "We promised these tax cuts would be rocket fuel for the American economy and we were absolutely right." The administration’s 2017 tax law was a $1.5-trillion, 10-year deal for tax cuts that was designed to spur economic growth last year to 3 percent. The Federal Reserve has to some extent rained on that parade by recently halting rate hikes because it sees growth slowing.